This first European Bitcoin exchange is based in Luxembourg. Bitstamp became sixth largest exchange and for the first six months of 2017 reached value of 12 million € in exchange processed transactions. It controls about 8,9% of the market. Bitstamp suspended its service after a hack during which less than 19,000 bitcoins were stolen in legendary January 2015 but it was reopened nearly a week later. Bitstamp charges for additional services and operational fees (f.e. Decline cash withdraws (0,55€), monthly account fee (1,95€), dormancy fee (1,95€). Bitstamp operates within a stringent legal framework enjoined by the European Union. It’s based in the United Kingdom and holds a vast portion of its coins in cold wallets to ward off hackers. Bitstamp processes payments through cryptocurrencies, bank transfers, and credit/debit cards. Even without crunching the numbers, Binance is way ahead of Bitstamp with its whopping volumes from consistently sizable trades. Website Interface: How friendly is it? 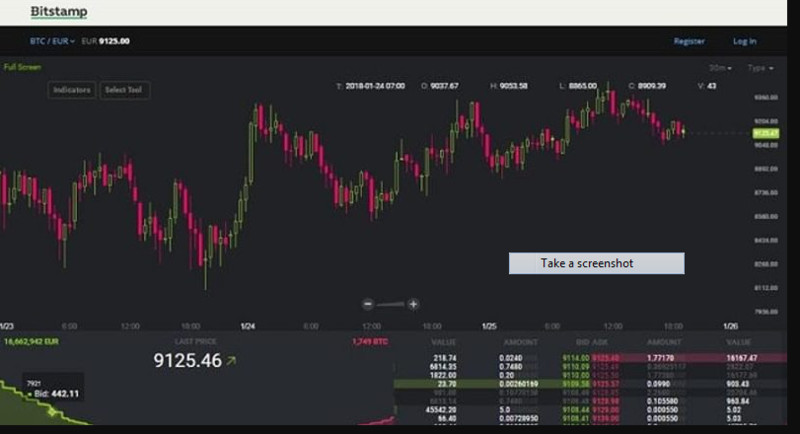 Bitstamp showcases an intuitive platform with a handful of exchange features paired with fresh data such as currency value, Live Trades, volume, and last price. The menu bar has profiles for accounts, transactions, orders’ status, redeem coupon, security, verify account, debit card, support, history, and change log. Bitstamp’s cryptocurrency offerings only include Bitcoin, XRP, and Litecoin with restricted exchange options. Beginners may find the interface complicated while trying to sell and buy. However, a help page rich in detail makes navigation a breeze for newbies. You have to learn the ropes by engaging repetitively with the platform to fathom charts and esoteric trading data. Bitstamp has complied with the legal framework of its place of domicile. It’s certified by the Registrar of Companies for England and Wales with a registered office in London. Unlike fly-by-night or non-registered exchanges, the company has endeared itself as a trustworthy market in the EU and yonder. Bitstamp has to adhere to strict English company and insolvency policy framework, as well as principles of corporate governance. December’s CryptoCompare review ranked Bitstamp as the third most stable market within the analysis aggregate pool of exchanges. It also attracted more than 360K visitors. Although Bitstamp has garnered a terrific customer rating for the time it has been around, there are still some small issues that need attention. While for most customers, Bitstamp is their Go-to Crypto Exchange, others feel their service rating is declining. Of late, it is not uncommon to come across complaints about Bitstamp. The main challenges revolve around: withdrawal issues, withholding of funds, long processing time for deposits and withdrawals, terminating users’ accounts, and at times, Support can be unhelpful. Even so, there are more positive reviews on Bitstamp than negative ones. Password secure directories and databases for improved user, domain and registrar protection. Secure Socket Layered (SSL) technology to keep data fully encrypted and transmitted across the cyber space securely. PCI Scanning automatically shields servers against digital terrorists and other vulnerabilities. Heartbleed attack protection prevents hemorrhage of memory contents. POODLE attack protection blocks intrusion of server encryption. Man-in-the-middle (MITM) attack protection keeps prying hackers at bay. Clickjacking attack protection prevents users from falling prey to hacking traps. Robot vulnerability protection prevents RSA decryption or signing operations. Multi-signature technology for both hot and cold wallets. Use of cold storages to safeguard digital assets. Use of two-phase authentication with dual passwords. Account information: account settings, passwords, username, and preferences. Contact information: email address, home address. Identity verification details: Scanned documents of a government issued document, such as a Passport, Driving License, or National ID. Financial information: Bank account, trading information, and bank statements. Info related to devices you are using to access Bistamp services, such as your IP address, Operating system, browser type, network system, etc. Info related to how you are using their website. Read: Coinbase Review: A comprehensive guide for 2019.
International wire transfer for non EU customers. You can also withdraw digital coins to a destination address. As for Bitstamp, it supports the following digital coins. As for Bistamp, you can either create an individual/personal account or a corporate account. For A personal account, you have to verify your personal details before you can deposit funds, and start trading. Basic account info like Names, address, country of residence, etc. Proof residence: here you have to submit documents like bank account statements, utility bills, tax statements, and on. Bitstamp has not specified limits for deposits or withdrawals. Some customers have been getting limits of up $20k on debit card purchases. However, it is likely Bitstamp will ask you for KYC documents if you transfer huge amounts. How much are we talking about? I’m not sure -- it can over $50k, $100k -- somewhere along those lines. Juxtaposing the two using available data, Binance is light years ahead of Bitstamp that misses out of the top ten global exchanges. Given that the EU contributes a negligible portion of the trading volume, we would expect Binance to blow its counterpart out of the water. 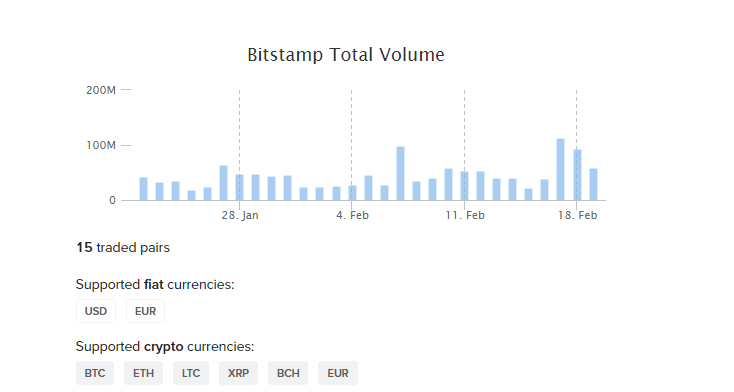 Coingecko shows Bitstamp had an average daily volume of $27, 013, 755 on February 4th 2019 -- in 24 hours. Most of the trades are done in BTC/USD, ETC/USD and BTC/EUR pairs. Does Bitstamp Restrict Any Countries? The Bitstamp mobile app keeps the crypto universe at your fingertips making trading convenient with up-to-the-minute information. The Android and iOS apps boast online platform features that add piquancy to the mobile world. Users can deposit or withdraw digital assets directly, complete payments using QR codes along with bitcoin addresses, reconfigure app with PIN code verification and access real-time insiders’ data. 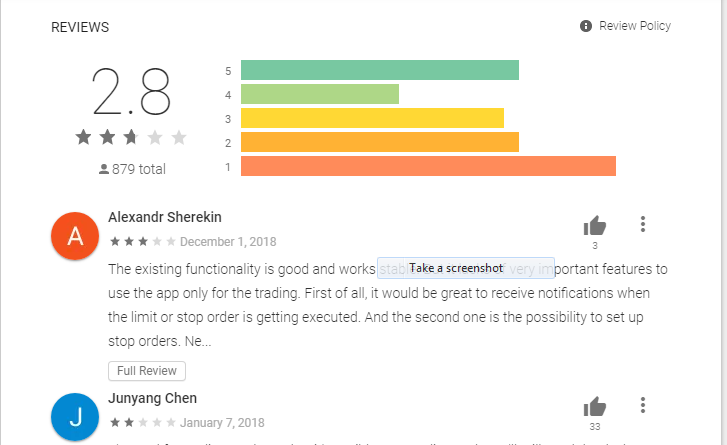 The functionality pales in comparison with Binance’s app because it omits various features that make up the lifeblood of trading. The bot does not allow you to trail stop losses, copy trading, and autonomous mean-reversion exchanges. It has raised more eyebrows from users upset by limitations and annoying bugs. The app has 2.8 star ratings on Google Play. Bitstamp has built a strong brand reputation with its innovative drive to enhance exchange features and crypto offerings. 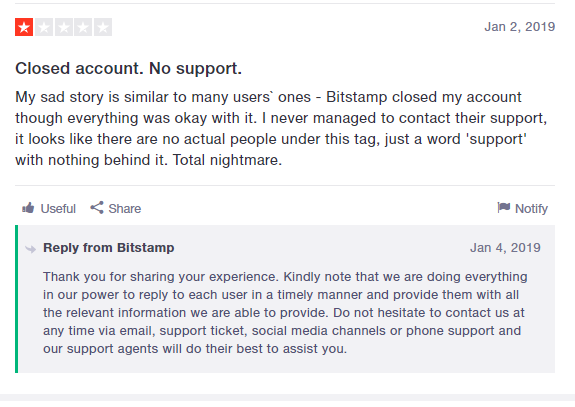 Bitstamp responds to any customer complaints directly with its support team. Unlike Binance’s ticketing system, you can send a message to support@bitstamp.net or call their Customer Care team at +44 20 3868 9628. Unlike most Exchanges that are a mess when it comes to customer service, Bitstamp are trying to be ahead of the game. 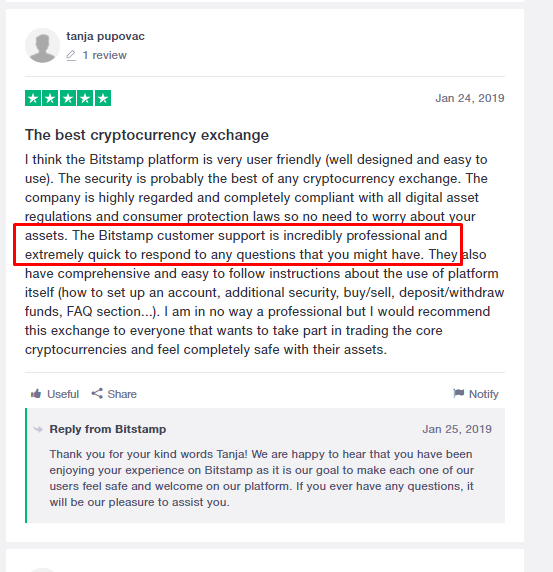 Not that the support service needs no improvements, but Bitstamp support has been praised for being quick, friendly, and professional. Bitstamp has a designated FAQ covering plethora issues revolving around beginner queries and advanced user concerns. It packs a rich vein of information if you want to get blockchain technology down to a fine art. Moreover, Bitstamp’s help page incorporates articles directing users on how to verify a personal account, make a first deposit, PGP Key, and trade cryptocurrencies. It is reputable and has good industry rating. It offers both simple and advanced features. Sometimes the customer support is slow. Credit card deposit carry high fees. Isn't Bitstamp right for you? Check its best alternatives.